Wow, where did October go?? I can't believe it's already November now and we have a new challenge for you over at Mixed Media Monthly! 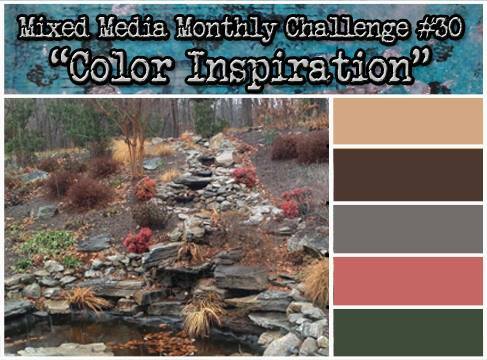 We want to see your projects inspired by the colors in our challenge graphic. The design team has been busy as usual, and wait until you see what they've all come up with. We also have a guest designer, Suzanne Czocek, and she has a lovely project for us to oogle! 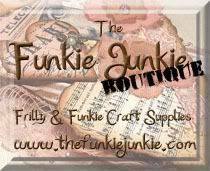 Our sponsor this month is The Funkie Junkie Boutique and they are offering a prize package to our random winner. All you have to do is join in the challenge for a chance to win. I utilized the faux batik technique for the background stamping so it would have a misty, textured look. It reminds me of some of the beautiful sunrises and sunsets we've been seeing here. I stamped and embossed the trees in two different colors of green embossing powder. Some clear crackle texture paste adds some nice distressing around the edges. At the bottom, I glued a piece of birch bark from my stash to a piece of cardstock and then die cut the scalloped edge. A few embellishments and Remnant Rubs complete the look! Be sure to head on over to the MMM blog to see all the inspiration by the design team and our guest designer. Join in our challenge and you will have a chance to win a gift pack from the Funkie Junkie Boutique. Lovely tag - the background is gorgeous. Absolutely love the background! 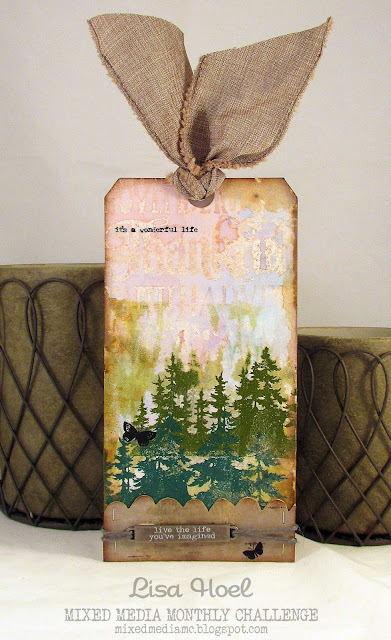 Really pretty tag! This is a lovely tag ! But that pretty TAG !! !, since love has as trees, overall layout and colors ... thank you very much !! Loved the background of the tag !! So much of detailed work !! Gorgeous tag!! I love the background and trees! Lovely fall tag! Glad I found the mixed media challenge blog. Great design team inspiration! I like the lift that embossing gives... this is fabulous! Very cool. Your tag has a nice peaceful feel to it.